A recent geological survey of Europa revealed that a massive 20,000 square-kilometer portion of the surface was missing. To explain it, a research team is now proposing that Europa's ice shell has a brittle, mobile, plate-like system above convecting warmer ice. 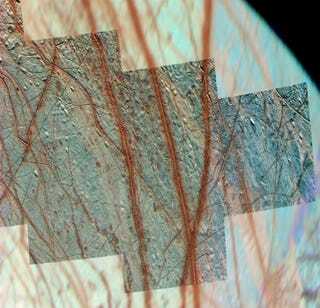 Above: False-color image of Europa's trailing northern hemisphere, where subduction zones are hypothesized to exist. Credit: NASA/JPL/University of Arizona. If confirmed, the finding would make Europa the only known place in the solar system other than Earth to have a surface shaped by tectonic plates. Previous work has shown that Mars once experienced plate tectonics, but those ancient geological process have likely come to an end. Researchers Simon Kattenhorn and Louise Prockter observed areas of the icy moon where cracks opened up and where new material came up from underneath the ice, creating new surface areas. "And unless the moon is expanding, which we don't think is the case, you have to remove surface from somewhere else in order to accommodate the new surface area being created," noted Kattenhorn in ABC Science. It's likely that a plate tectonic system is moving old portions of Europa's surface beneath adjacent plates, similar to subduction zones on Earth. "We were able to reconstruct the original pattern of these features like pieces of a jigsaw puzzle, matching the geology patterns. You could see that rigid portions of the surface had been rearranged like tectonic plates." As the authors matched up the geology, they found that a piece of the surface was missing along a boundary between two tectonic plates. "We think one plate of ice sank beneath the other into warmer ice layers below at this boundary, just like subduction zones on Earth," says Kattenhorn. The subducting plates move a few kilometres down and are reincorporated into the ice shell. Friction generated during subduction, produces heat which melts the ice and causes cryovolcanic (ice volcano) activity on the surface. "There are patches on the surface near subduction zones that look like lava," says Kattenhorn. "This is water that's melted, has come up and flowed across the surface before freezing, just like a lava flow." This process is similar to what happens to the Earth's crust, which is segmented into numerous tectonic plates that are moved by convecting heat. This is all very good news for astrobiologists because it points to complex and dynamic chemical processes. The recycling of material between the surface and the interior has implications for potential habitability. As noted by the researchers, "We know materials on the surface are being chemically altered by Jupiter's radiation, so those compounds generated at the surface could be moved back down into the subsurface." Read the entire article at ABC Science. And check out the study at Nature Geoscience: "Evidence for subduction in the ice shell of Europa."